Dan Drollette» Blog Archive » LHC science video from Jesse Dylan? LHC science video from Jesse Dylan? 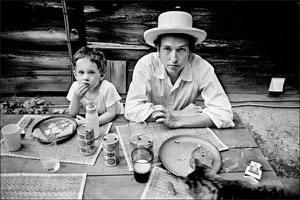 According to an article in today’s “New York Times,” Jesse Dylan — seen with his father, folksinger Bob Dylan, in the 1968 photo above — is in the final stages of a film about the Large Hadron Collider (LHC). Has anyone heard anything about this? Is it a documentary, a short, a feature? The Times’ piece only mentions it in passing, saying that Jesse Dylan screened a preview copy in Los Angeles a few days ago, in front of a variety of physicists, including some from CERN who were the driving force behind the LHC. An article in The Wall Street Journal entitled “Jesse Dylan Experiments With Science; an accomplished director turns his camera on medical research” says that the younger Dylan has done a number of movies, ranging from “American Wedding” to rock videos with Elvis Costello, along with science documentaries — which previously focused on health. Hope to find out more about it! This entry was posted on Tuesday, January 26th, 2010 at 3:36 am and is filed under Uncategorized. You can follow any responses to this entry through the RSS 2.0 feed. You can leave a response, or trackback from your own site.